We hit the Mill Race Historical Village Sunday morning while on an expedition for some photos. 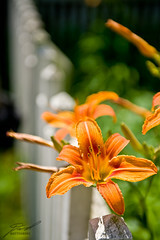 These daylilies lined the fence by one of the homes there. We waited for the sun to escape from the clouds and popped off a few bright shots.